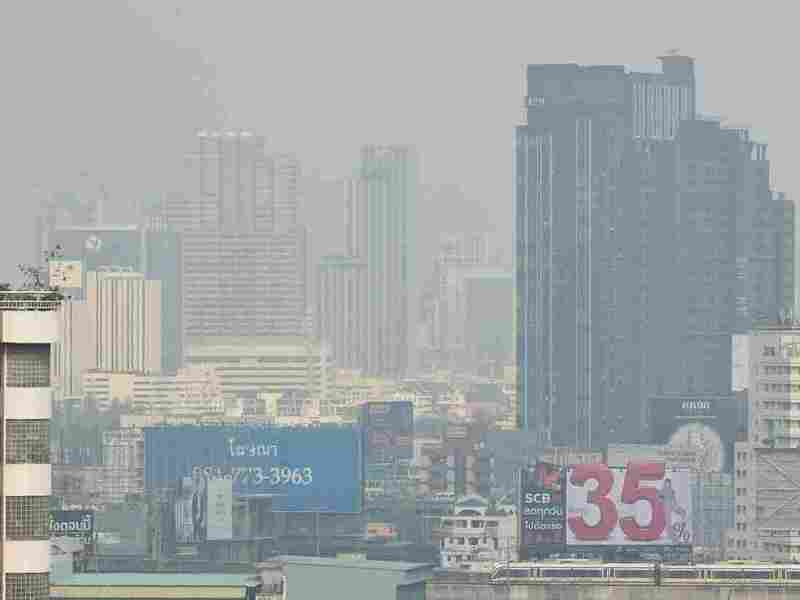 Thai Officials Close Schools As Toxic Air Pollution Chokes Bangkok Fine particulate matter floating through the murky haze that hangs over the city has reached harmful levels, leading the government to shutter more than 400 public schools. Thailand's Pollution Control Department declared air quality in the the Thai capital unhealthy, leading to the closure of 400 public schools through the end of the week. The chemical haze of yellowish smog blanketing the sky across Bangkok is so toxic that officials announced more than 400 public schools throughout the Thai capital will be closed on Thursday and Friday. Additionally, officials fear conditions will be exacerbated by next week's Lunar New Year celebration which will include widespread use of fireworks and incense. They are urging the public to refrain from lighting either as they welcome the new year. Traffic exhaust from vehicles and smoke pollution from factories, wood burning stoves, coal and burning fields are all faulted for increasing the amount of harmful microscopic dust particles known as PM2.5, which can travel into the bloodstream and into every organ in the body. According to Reuters, the Department of Pollution control said the amount of PM2.5 in the city on Wednesday exceeded the safe level in 41 areas. "We will assess the situation on Saturday and Sunday to see whether there would be the need to close all schools further next week," government spokesman Puttipong Punnakan said. Edward Avol, a professor who researches the effects of air pollution in children in the department of preventative medicine at the University of Southern California, told NPR that in addition to the respiratory problems caused by particulate matter, toxic air also leads to a range of neurological outcomes in children and adults. "We're seeing a wide range of effects across the age spectrum," Avol said. "Younger kids can develop learning problems ... they have a hard time paying attention in class, focusing and staying on task." "In older adults, health studies show that people breathing in bad air are losing cognitive functions," he added. He noted that when children stay home it also serves to reduce the amount of traffic on the streets because fewer parents or caretakers are shuttling students to and from school. But the downside is that often conditions at home may be worse than those in a classroom. "It may be cleaner inside the school than at home, especially if kids end up playing in the streets all day. At school, teachers can close the doors and windows, and the rooms might even have air conditioners or air filtration systems," Avol said. As the country faces future chronic air problems, Prime Minister Prayuth Chan-Ocha, leader of Thailand's military government, said he's considering shuttering "some factories during pollution spikes to tackle the problem," Bloomberg reported. To that end, Prayuth has directed soldiers to inspect and compile a list of the worst polluters. Other measures the government has taken to clear the air of choking smog include spraying water out of giant cannons into the sky. A strategy that the director general of the Pollution Control Department of Thailand said is well-intentioned "but maybe this is not the best thing." Local air pollution experts have urged lawmakers to pass a series of driving and parking restrictions to ease traffic congestion across the city and bring down levels of PM2.5. The number of vehicles on Bangkok's roads have increased dramatically in recent years, from 6 million in 2005 to nearly 10 million in 2018. Supat Wangwongwattana, former chief of Thailand's Pollution Control Department, made a series of recommendations in the Bangkok Post last year, including a 90-day ban on certain vehicles on days when the AQI is especially high. He also suggested heavy trucks could be barred from entering the city during rush hour and that authorities limit car usage to even or odd days of the month. The New York Times reported at one point the government also considered using giant fans to blow the pollution out of town. The World Health Organization says 4.2 million people die every year as a result of exposure to outdoor air pollution, and when combined with household air pollution deaths, the number spikes to 8 million. Additionally, 91 percent of the world's population lives in places where air quality exceeds the agency's guideline limits.